Habit: Tecoma stans grows as a large shrub to small tree up to 5 meters in height. The pinnately compound leaves are arranged oppositely. There are 5 -13 leaflets that are ovate to lanceolate, with an acuminate leaf apex and serrate leaf margin. The vegetative portions of the plant can be glabrous or pubescent. The zygomorphic flowers are arranged in terminal racemes. The calyx has 5 fused, greenish sepals. The corolla has 5 yellow fused petals that are bilabiate. There are 4 stamens fused to the corolla tube. The superior ovary has 2 locules and forms a capsule at maturity. The seeds are winged. Habitat: Tecoma stans occurs in human-disturbed areas such as abandoned fields and yards as well as along the edges of Dry Broadleaf Evergreen Formation –Shrublands (Scrubland Coppice) in either sand or limestone substrates. 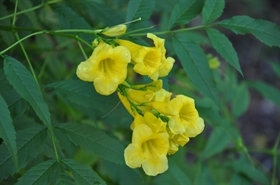 Distribution in Bahamas/Globally: Tecoma stans occurs throughout the island groupings of the Bahamian Archipelago and is now common in the New and Old World tropical and subtropical regions. It is thought to be native to the Old World tropics. Medicinal/Cultural/Economic usage: Tecoma stans has no known medicinal plant usage in the Bahamas. It is used in the horticultural industry because it is drought and semi-salt tolerant. It is considered invasive in areas of the South Pacific. Tecoma stans is the national flower of the Bahamas.